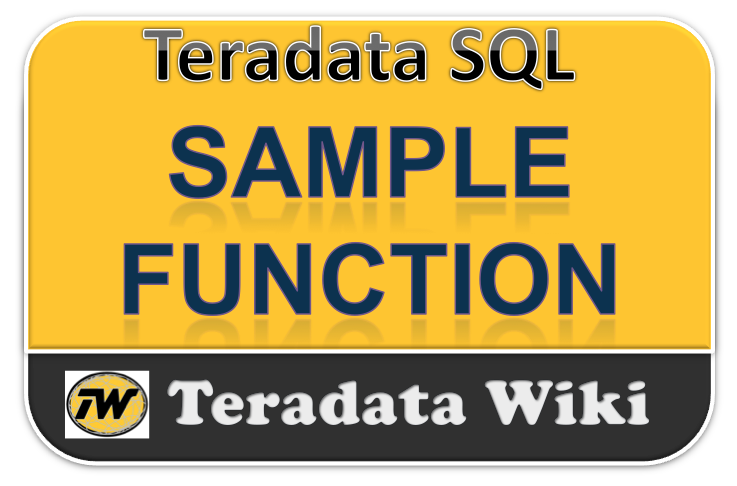 The teradata SAMPLE function is used to generate samples of data from a table or view. SAMPLE n - Will results a sample of n rows. If the number n is greater than the number of rows in the table, the sample will consist of the number of rows in the table. A percentage of a table. In the above example, 25% of the rows of the employee table are to be returned. The employee table has 26 rows. 7 rows out of 26 are returned. Fractional results greater than .4999 generate an added row. 25% of 26 = 6.5 which rounds to 7. SAMPLEID is an extension for Sample to get multiple set in a single query. The SAMPLEID may be selected, used for ordering, or used as a column in a new table. Lets consider department table has 9 rows and get three samples from the department table, one with 25% of the rows, another with 25% and a third with 50%. Note that all 9 of the 9 rows of the department table are returned. This is due to the individual calculations. Get three samples from the department table, one with 27% of the rows, another with 35% and a third with 2%. The first two samples are able to return rows. The last sample is too small to return a row. Get three samples from the department table, one with 3 rows, another with 5 and a third with 8. *** Query completed. 9 rows found. 2 columns returned. *** Warning: 7473 Requested sample is larger than table rows. Because the rows are not repeated to different sample sets, the supply of rows is exhausted before the third set can be completed. This results in a warning that there were not enough rows to populate all samples as requested. This warning is seen in the BTEQ environment, but not in ODBC. The third sample gets the only remaining row.